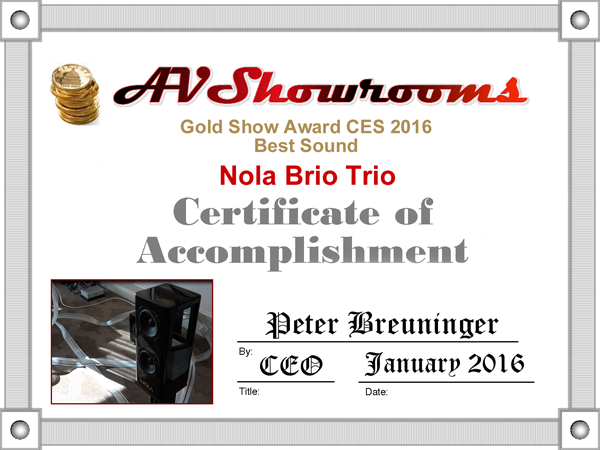 Nola by Accent Speaker Technology, Ltd.
NOLA introduced its Brio Trio satellite/ subwoofer loudspeaker system at CES 2016: a compact, high-end three-piece package featuring NOLA's hallmark open baffle design and a novel "1½ way" enclosure for the main speakers. The Brio Trio lives up to its name with sonic vitality and dynamic realism that far exceeds its compact size. It's ideal for use as a desktop monitor system or a top quality 2.1 channel system in smaller rooms or where space is limited yet uncompromising sound is desired. Measuring just 5½ by 5½ by 12 inches, the Brio main speaker employs two identical 3½ inch (90 mm) drivers, with the upper driver operating in an open baffle as a dipole and the lower driver mounted in a ported chamber. This configuration combines the natural imaging and expansive soundstage provided by the open baffle mounting with the dynamic presence and impact of the enclosure-mounted driver. The matching subwoofer utilizes an 8-inch, long-throw, high-power-handling bass driver in a sealed enclosure, powered by a Class A/B 250-watt amplifier. 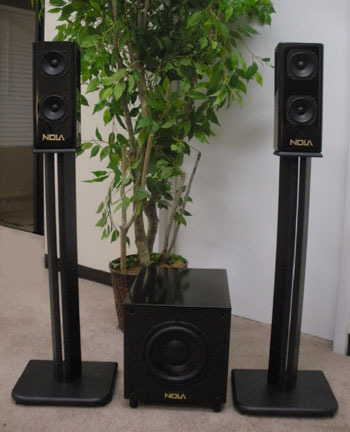 NOLA chose Class A/B rather than the more typically used Class D subwoofer amplifier topology because of the A/B design's superior sound quality. The amplifier is a smaller version of the one used in NOLA's T Bolt subwoofer. The subwoofer provides continuously variable level and crossover frequency controls (from 40Hz-180Hz, 24dB/octave), 6dB at 35Hz switchable EQ, a phase switch and line-level and speaker-level inputs, enabling it to be seamlessly matched to the Brio main speakers and deliver optimum performance in any system and room. Performance achieved is far beyond expectations for this type of system. 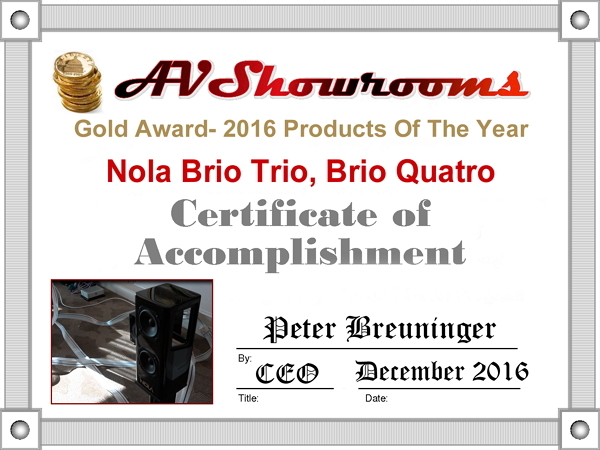 The Nola Brio Trio satellite/subwoofer system is available now in gloss black finish at $3500.